Er singt wie Roy Orbison. Seine Band fusioniert Country mit Rock and Roll, Tex-Mex und Pop. Beim kubanisch-amerikanischen Sänger Raul Malo und seiner Band The Mavericks denkt man gleichzeitig an Dean Martin, Johnny Cash, die Kumbia Kings und Wilco. Sie sind die Lieblinge des Feuilletons, treten in der Londoner Royal Albert Hall auf und stehen bei Leuten über vierzig im Plattenregal neben Lucinda Williams und Ryan Adams. Die Mavericks haben sich mit ihrer tanzbaren Spielart des Alternative-Countrys verewigt. Ihre Hits, wie “All You Ever Do Is Bring Me Down”, “Here Comes The Rain” und “Dance The Night Away” laufen immer noch regelmäßig im Radio. Aufgeregt, naiv und dreist erschienen Malo und Co. zum Ende der 1980er in der Post-Punk-Szene Miamis. Sie traten gemeinsam mit Metal-Newcomern wie Marilyn Manson auf. 1991 fuhren sie von Miami 1500 Kilometer nach Nordwesten, um in Nashville einen Showcase-Auftritt zu geben, zu dem sämtliche Artist & Repertoire-Manager der Music City hinströmten – ein nach ihnen benanntes, beim Indielabel Cross Three erschienenes Album hatte sie über Florida hinaus zum Geheimtipp gemacht. Danach unterschrieben die Mavericks beim Label MCA. Der erste Achtungserfolg war ihr Cover des Hank Williams-Songs "Hey Good Lookin´", der die Top-100 erreichte und auf ihrem Debütalbum bei MCA: From Hell to Paradise erschien. Der Durchbruch kam 1994 mit dem Album What A Crying Shame, das in die Top-10 der US-amerikanischen und kanadischen Charts einzog. Eingespielt in Nashville, brachte es das Raue, Ungeschliffene in den Mavericks hervor. Music for All Occasions verkaufte Gold und Platin in Amerika. Für den Albumsong "Here Comes The Rain" gewann die Band 1996 einen Grammy in der Kategorie Best Country Performance By A Duo Or Group. Gefolgt von Trampoline, das auch die Top-10 der britischen Albumcharts erreichte. Dann wurde es stiller um sie. Raúl Francisco Martínez-Malo Jr. begann eine Solo-Karriere. Der stämmige Mann aus Miami wurde zum neuen Inbegriff des Lonely-Crooners, weiter in den Fußstapfen Roy Orbisons, mit dieser Mischung aus Einsamkeit, Verlangen und Lebenshunger in der Stimme, mit diesem "erhabenen Bariton, so erdig und dann quasi opernhaft", schrieb 2014 die Tampa Bay Times über Malo. Die musikalischen Superhelden namens Mavericks hatten 2012 mit ihrem sechsten Album In Time – dem ersten nach zehn Jahren – ein Comeback. Gut zwanzig Jahre nach ihrem Debüt zogen Malo plus Keyboarder Jerry Dale McFadden, Schlagzeuger Paul Deakin, Multi-Instrumentalist Robert Reynolds, verstärkt vom Gitarristen Eddie Perez (Dwight Yoakam, Miranda Lambert, George Strait, Lee Ann Womack) wieder in die Top-10 der Countrycharts, applaudiert von der Presse: "The Mavericks klingen erfrischt, ausgeruht und besser als je zuvor", urteilte das Q-Magazine. Nur die beste Popmusik sei so "griffig und mitreißend" wie der Sound der Mavericks, befand die Los Angeles Times: gerade noch rechtzeitig seien sie zurückgekommen. 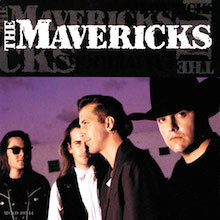 The Mavericks sind nie eine konventionelle Band gewesen und sie werden es nie sein. Malo meint, mit ihrer Genre-Offenheit hätten sie es heute leichter in der amerikanischen Musiklandschaft als vor 25 Jahren. "Damals waren wir unserer Zeit voraus", resümiert der 49-Jährige. "Wir nannten uns eine Country-Band, um in Nashville einen Deal zu bekommen, und dann machten wir, worauf wir zum Teufel einfach Lust hatten." Ihr jüngstes Lebenszeichen war eine Film-Noir-Version des Mötley-Crüe-Songs "Dr Feelgood" auf dem 2014 erschienenen Album "Nashville Outlaws – A Tribute To Mötley Crüe". Sie zeigt die Unbändigkeit Malos. Wer weiß wann sich David Lee Roth bei ihm meldet? As their career progresses, the Mavericks are becoming more of a showcase for vocalist/frontman Raul Malo, both for better and for worse. They may be losing their band identity, but that may have been inevitable, considering that Malo is such a gifted, powerful musician. He is the driving force behind all of the group's stylistic fusions, their blend of honky tonk with country-rock, classic rock & roll, pop, and Latin. On Music for All Occasions, the stylistic blends sounded a little gimmicky, but the band sounds revitalized on Trampoline -- even the vaudevillian "Dolores" rings as true as the shuffling, cha-cha "I Should Know." If anything, the album is the least "country" album the Mavericks have ever done, but that's primarily because all of their influences have blended seamlessly together, creating an original, altogether intoxicating sound. Furthermore, they're not simply surface -- Malo's songs are clever constructions, ranking among the most imaginative roots songwriting of the '90s. His writing, combined with his band's musical panache, makes Trampoline a ride worth taking. The Mavericks made their major-label debut with their second album, 1992's From Hell to Paradise, and while co-producer Steve Fishell added a lot more gloss than the band could summon up on their first independently released disc (not all of which works in their favor), overall this set sounds noticeably stronger and more sure-footed than The Mavericks did their first time at bat. The slicker sound certainly makes the most of Paul Deakin's sharp drumming and Robert Reynolds' rock-solid bass, and vocalist Raul Malo gained plenty of control and confidence this time out, with his clear, flexible tenor shining bright on every track, especially the plaintive "This Broken Heart" and the dramatic title song. Between the Farfisa-flavored pop of "I Got You," the rockabilly-accented locomotive charge of "End of the Line," and the Latin accents of "From Hell to Paradise," the broad stylistic range of the group's best work was beginning to make itself felt, as well as intelligent and challenging lyrical themes which set them apart from the average bunch of Nashville cats (significantly, From Hell to Paradise was recorded in that noted country music Mecca of Miami, FL). A few tunes are a bit more formulaic than one might hope for, and while the Hank Williams and Buck Owens covers are fun (and show good taste), they aren't especially enlightening. But there's enough good stuff on From Hell to Paradise to confirm the musical promise of The Mavericks' first album, and pave the way for their breakthrough with What a Crying Shame. The Mavericks fully hit their stride with their third album, 1994's What a Crying Shame, in which the band's blend of rootsy country and vintage pop sounds finally found the balance they'd been searching for. 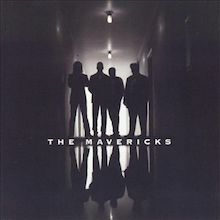 While producer Don Cook gave the band a significantly glossier sound than that of their first two albums, with a hefty number of guest musicians (and guest songwriters) on board, remarkably enough The Mavericks' personality wasn't subsumed in the process; if anything, the high-priced help seemed to have prodded the boys into playing at the top of their game. Raul Malo's keening tenor gets a superb workout on "I Should Have Been True" and the title cut (the latter of which boasts a guitar hook Roger McGuinn would have been proud to come up with), while "Pretend" and "There Goes My Heart" are honky tonk floor-fillers of the first order. Robert Reynolds and Paul Deakin are a rhythm section who can give these songs the nervy drive of a rock band without betraying The Mavericks' country leanings, and they give the covers of "All That Heaven Will Allow" and "O What a Thrill" a taut foundation most contemporary Nashville acts lack. Truth to tell, What a Crying Shame doesn't have a single dud track, and offers encouraging proof that it's still possible to make an engaging and idiosyncratic country album while signed to the Nashville division of a major label...and the best news is, the band managed to turn that accomplishment into a hat trick over the next few years. 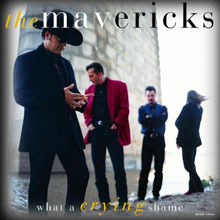 After the commercial and critical success of What a Cryin' Shame, the Mavericks were given a bit more creative latitude while making their fourth album, 1995's Music for All Occasions; lead vocalist Raul Malo co-produced the disc, and the '50s pop accents that were bubbling under the surface on their previous set began to rise to the surface, both in their music and in the wink-and-nudge camp of the album's artwork. Malo's deeply emotive tenor voice was made to order for polished supper-club pop tunes like "Foolish Heart" and "Missing You," and while the production and arrangements here possess an appropriate degree of high gloss, the band still finds room to let their own personalities shine though, especially guitarist Nick Kane, who makes with some fine hipster jazz picking. the Mavericks do inject a little classic country into this set, most notably the potent two-step of "The Writing on the Wall," and they were able to have their cake and eat it too with the melodramatic "Here Comes the Rain" and the lively Tex-Mex rave-up "All You Ever Do Is Bring Me Down" (featuring Flaco Jimenez on accordion), both of which were major hits. While What a Cryin' Shame was a slam dunk of an album, Music for All Occasions is a slyer, more subtle affair, and the polished cool of its surfaces aren't as immediately inviting, but the record's abundant pleasures become clear upon repeated listenings, and its one of the group's best and most accomplished studio sets. 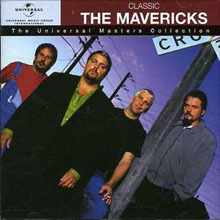 The Mavericks were one of the most acclaimed country bands of the '90s and, for a brief moment, were among the most popular. With their third album, What a Crying Shame, they were at the zenith of their creative powers and were rewarded with great reviews and sales. They maintained a high level of creativity with its two follow-ups, 1995's Music for All Occasions and 1998's Trampoline, but their audience shrank somewhat, turning into a cult following much like Lyle Lovett's -- they were popular, going gold with their new albums, but they didn't have crossover hits. That was a crying shame, because as the 1999 singles collection Super Colossal Smash Hits of the 90's: The Best of the Mavericks proves, they kept a high level of quality. That doesn't mean that Super Colossal is a perfect collection, however. Like most '90s hits compilations, it's baited with unreleased material. Usually, that means there's just one or two new cuts. This time, there are no less than four new tracks, which means there are only eight hits on the record. The new material -- including covers of "Here Comes My Baby" and "Think of Me (When You're Lonely)" -- isn't bad, and the Tex-Mex-flavored "Pizziricco" in particular is pretty good, but the fact that a quarter of the album is devoted to new material means that there's a lot of good stuff missing here. Still, it's a good roundup of the best of the best, and a nice reminder to casual fans that haven't paid attention since What a Crying Shame that The Mavericks have a lot more to offer. Although they first broke into the limelight marketed as a country act in the 1990s, Miami's Mavericks, led by the soaring, Roy Orbison-like vocals of singer Raul Malo, and with a sound that blended country elements with Tex-Mex, Latin, and Cuban touches, along with pure pop, proved to be a little too diverse (OK, a lot diverse) for the narrow confines of Nashville's version of commercial country. 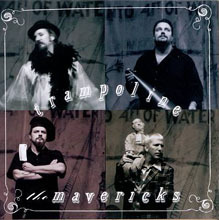 The band parted ways as the decade closed, reunited for a single album in 2003, then split up again while Malo, always the focal point and the main songwriter in the group, went on to release several solo albums that explored different genre avenues before the Mavericks reunited once more in 2011. 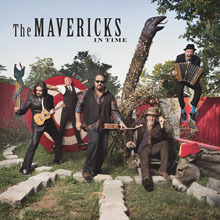 This album, In Time, is the result, and it's a further step away from anything resembling a mainstream country release, incorporating not only the Tex-Mex and Cuban influences the band was known for, but also the rhythms of polkas, tangos, and all manner of approaches, making them closer to a band like Los Lobos than to Tim McGraw or Jason Aldean, or whoever passes for the face of country music these days. Malo co-produced this set (with Niko Bolas), and he wrote or co-wrote all of the songs here, and his versatile and incredible vocals are, as they should be, the center of everything. Tracks like the floating shuffle "Back in Your Arms Again," the pop gem "Born to Be Blue," the Roy Orbison-like "That's Not My Name," and the powerful and relentless "(Call Me) When You Get to Heaven" (a stunning, passionate, and wrenching ballad that builds and rises to a honest-to-goodness bolero crescendo) prove that neither Malo nor the rest of the bandmembers have lost nary an inch during the layoff, and if anything, have grown much more explorative and adventurous. To say this album is a return to form wouldn't be quite correct. It's an extension of it. On their first studio album since leaving MCA in 1999, the Mavericks find themselves at a creative crossroads. While vocalist and songwriter Raul Malo is able to freely indulge his muse on any number of projects, the band as whole has been making numerous musical decisions. The results are not always positive. First, the good news: when at their best, as they are for a good part of this recording, the Mavericks are simply the best there is. On tracks such as "In My Dreams," informed as it is by Roy Orbison's ghost and Malo's deeply expressive singing, the band becomes larger than life. Singing a midtempo ballad, the band gathers around him and allows him to walk out on the emotional edge of his vocal and dig a lot deeper than the arrangement would normally suggest. Likewise, on the son-infused "Shine a Light" sheeny Cuban soul acts as the fiber the tune builds upon. A well-placed horn section and numerous strains of polyrhythmic drive make this the party tune everybody's been waiting to hear from them. Likewise, the slow rumba feel of "Wondering" with Malo's '50s-influenced singing makes this the greatest song k.d. lang never recorded. "By the Time" showcases the band's still deep country waltz roots, and the B-3 touch that hovers in the background is positively haunting. The slightly funky country AOR root of "Time Goes By" is one of the dirtiest and most emotional tunes the group has ever recorded. The Latin lounge of "San Jose" -- not the Bacharach tune -- would be the best thing on the album if it weren't for the badly intoned synthed-out strings. Likewise, "Would You Believe" and "Because of You" with their thickly textured busy-ness draw away from the emotion inherent in them, and they are swallowed by arrangements. The performance of "Air That I Breathe," while valiant and seemingly heartfelt, cannot redeem this song from the shmaltz pile. the Mavericks are still more than capable of coming up with the goods when it comes to fine songwriting and performances, but next time they should hire a producer to rough up their overly rounded surfaces. Malo may indeed be the problem, trying to maneuver his band into playing for his solo moods, but with a unit this fine, he should be writing for them. I like dance the night away and every track on this album is just as good. Would recommend it if you like country and western music. 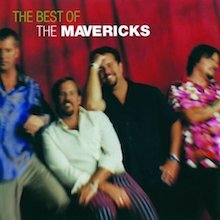 O What a Thrill: An Introduction to the Mavericks conspicuously avoids the phrase "greatest hits" in its title, and for a good reason: This collection appears to consciously avoid most of the group's best-known songs, instead focusing on some of the lesser-known gems in the group's catalog. Featuring material from all the group's first six albums, O What a Thrill does an admirable job of capturing the eclectic spirit of the Mavericks, ranging from the honky tonk stomp of "Hey Good Lookin'," the jazzy countrypolitan mood of "Foolish Heart," the country-rock shuffle of "All That Heaven Will Allow," and the pure pop melody of "I Don't Even Know Your Name." 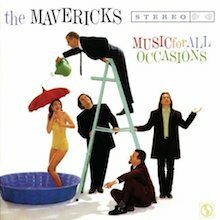 On this set, the Mavericks cover a lot of bases and cover their territory admirably well, with Raul Malo's superb vocals at the forefront throughout and his partners Paul Deakin, Robert Reynolds, and Nick Kane offering first-class support. 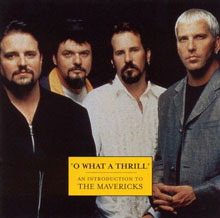 Given the Mavericks' eclectic approach and the distinct personalities of their studio albums, O What a Thrill takes on a hefty challenge by attempting to represent the group's multifaceted body of work, but it achieves its goal with admirable success, and its a fine calling card for the group's excellent back catalog. The Mavericks - It's Now! It's Live! The guys who make up the country group the Mavericks began their professional music career performing together at rock clubs in Florida. Now you might think that's a long ride from Nashville, but they found their way easy enough. 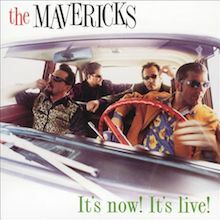 Once they did, they didn't leave everything they learned in those rock clubs behind though, and listeners won't miss the rock & roll flavor that the Mavericks stir into a number of the songs on this 1998 album, It's Now! It's Live! As the title foretells, this is a live album. It was made during a couple of shows the group did in Canada. This is great country-rock music done the way the Mavericks do it best, but the album is a little short with only seven tracks. The songs are fan favorites though, like "There Goes My Heart," "Tonight the Bottle Let Me Down," and "I Don't Care if You Love Me Anymore."